Few plants brighten up a landscape like flowers. Blooming plants welcome visitors to your home with their attractive, colorful blossoms. Although some types of flowers require plenty of space to grow, other varieties perform nicely in pots and containers. 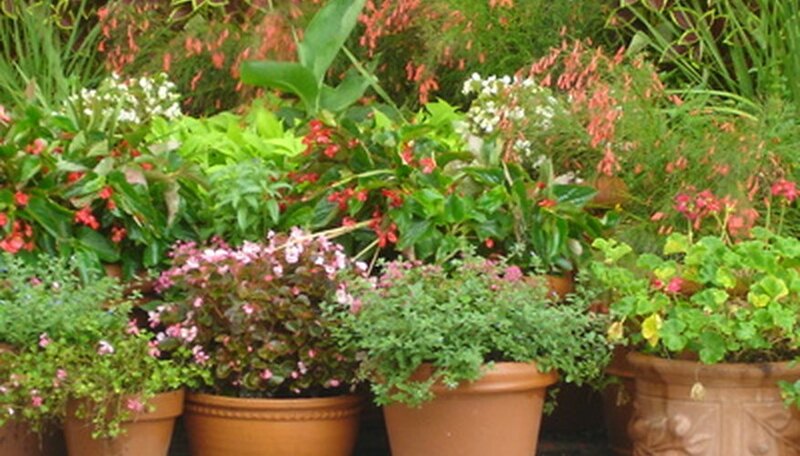 Use these container plants in pots near your entryway, along a porch or on a patio. Select flowering varieties that celebrate the seasons, adding color to your yard and enhancing your landscape design with their splendor. Impatiens Sultana (Impatiens walleriana) flourishes in containers placed in slightly shady areas. This plant, also called the Patience Plant, displays colorful blossoms in shades of pink, white, red and purple throughout the months of June through September. This annual flower often reseeds itself and makes a nice houseplant indoors. It prefers well-drained soils. It forms a slightly bushy shape in the container, reaching a height between 6 and 24 inches. An attractive plant in rock gardens and borders, the Blue Cup Flower (Nierembergia hippomanica) produces small, cup-shaped blossoms in shades of white and blue. This annual grows about 6 to 18 inches, making it a good choice for a container garden. This plant prefers slightly moist soil in areas with semi-shade. A bright and cheerful flower, Calendula (Calendula officinalis) enhances pots and containers during the late summer and early fall months. Calendula blossoms in shades of yellow and orange. These blossoms form along stems that grow to a height of about 1 foot. This flower tolerates a variety of soil conditions and flourishes in areas of slight shade. The medium size of the tufted bluebell (Wahlenbergia communis) makes it a nice plant for a container garden. These flowers thrive in warmer climates that do not experience hard frosts. They grow well in zones 8 through 11. A native to Australia, these perennial plants produce masses of light blue flowers that resemble small stars. This showy flower blooms in spring and summer on stalks that reach almost 30 inches in height. It grows in average soils and tolerates arid conditions. Set this potted plant in an area that receives partial sunlight during the day. Suitably named, baby’s breath (Gypsophila elegans) appears dainty and delicate in containers and pots. These annual plants reach a height between 12 and 18 inches in pots. Small, white blossoms appear on the fine network of stems during the second half of summer. Baby’s breath plants require areas with full sunlight and well-drained soils. These annuals often reseed themselves in their containers, providing enjoyment year after year.